School children march “Walk more Eat Less” led by Dr.Vijay Viswanathan during the occasion of World Diabetes Day on Nov’14, 07 at Nageswara Rao park, Chennai. School children thronged at Nageswara Rao park displaying their art work on “Prevent Childhood Obesity” at the event of World Diabetes Day on Nov’14,2007 School children displaying theirart work on “Prevent Childhood Obesity” at a function on Nov’14 2007. 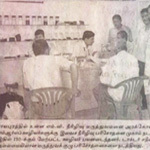 Dr.Vijay Viswanathan is seen standing at the centre. 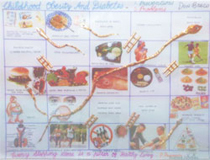 are on the move by holding the banner on “Walk more Eat Less” at World Diabetes Day function on Nov’ 14, 2007. Dr. Vijay Viswanathan, Managing Director, M.V. Hospital for Diabetes & Diabetes Research Centre, Chennai flagging off the walk of school children at Nageswara Rao park during the occasion of World Diabetes Day on Nov’14,2007. Walk by M.V.Hospital Team at Nageswara Rao park on the occasion of World Diabetes Day on Nov.14, 2007. Kendriya Vidyalaya , K.K Nagar, Chennai receiving the 2nd winner trophy for the posters competition on Childhood Obesity and Diabetes from noted film director Mr. K.S. Ravi Kumar at a DRC function held at IMAGE Auditorium , Chennai on Nov.11, 2007. 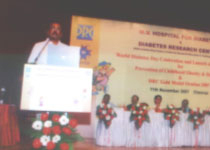 Dr.Vijay Viswanathan is speaking at the launch of Mylapore Weight Management Clinic on October 16, 2007. 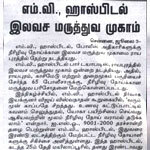 Thiru M.Ravi. I.P.S. JCP (North) and Wg.Cdr (Retd) B.Raghavan are seen in the picture. School children from Kendriya Vidyalaya K.K.Nagar, Chennai at the Inter School Poster competition held on Nov’11, 2007 at IMAGE Auditorium by Diabetes Research Centre, Royapuram, Chennai. A poster display by Don Bosco Public School, Egmore, Chennai on “Prevent Childhood Obesity” at a Inter School Poster competition held on Nov’11, 2007 by Diabetes Research Centre, Royapuram, Chennai Rajaji Vidyashram, Bhartatiya Vidya Bhavan receiving the 3rd winner trophy for the poster competition on Childhood Obesity and Diabetes from noted film director Mr. K.S. Ravi Kumar at a DRC function held at IMAGE Auditorium, Chennai on Nov.11, 2007. School Minister inaugurates the event. Minister releasing first copy on the Childhood Obesity & Diabetes Manual to Mr.Jagannathan, Director of School Education, Govt. of Tamil Nadu. Thiru Thangam Thenarasu (Right), Hon'ble School Education Minister, Govt. 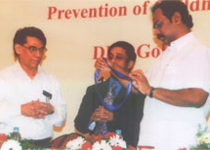 of Tamil Nadu, presenting DRC Gold Medal, 2007 to Dr. T.Ramasami (Left), Secretary, Department of Science & Technology, Govt of India. 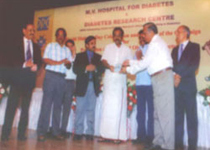 Dr. Vijay Viswnathan, Managing Director, M.V.Hospital for Diabetes and Diabetes Research Centre, is at the centre. M.V.Centre for Diabetes, Mylapore Thiru. 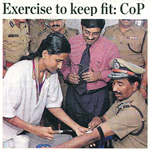 M. Ravi IPS he is innaugurating the weight management clinic at Mylapore. Dr.Vijay Viswanathan Managing Director and Cine Actress Mrs. Seema or in the picture. School, Education Minister Thangam Thennarasu greets T.Ramasami, Secretary, Department of Science and Technology, after presenting him with the DRC Gold Medal Oration Award-2007 in Chennai on Sunday. Vijay Viswanathan, Managing director, M.V. Hospital for Diabetes. 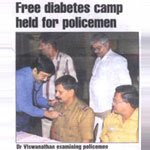 Free treatment in Arakkonam Free Medical News in camp of Police Personnel held on 17th July in News Today Free Medical News in camp of Police Personnel held on 29th July in Dinamalar. 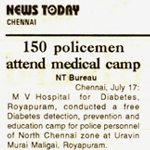 News of 007Free Medical Camp of Royapuram Police Personnel held on 29th July in Deccan Chronicle City Police Commissioner Nanchil Kumaran at medical camp for police organised by M.V. Hospital for Diabetes on Wednesday. 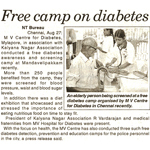 An elderly person being screened at a free diabetes camp organised by MV centre for Diabetes in chennai recently. Copyrights © 2017 M.V.Hospital for Diabetes, Royapuram, Chennai.